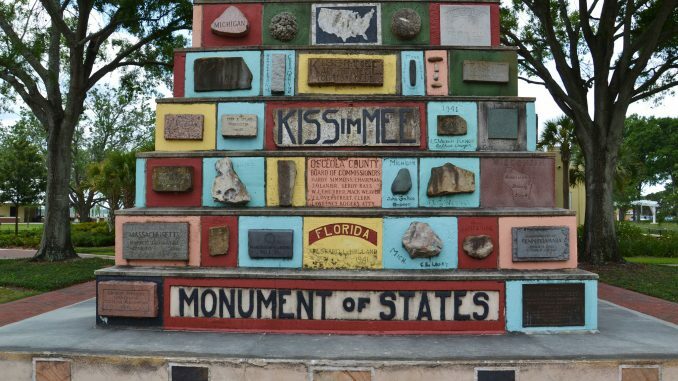 Conceived as a symbol of American unity after the attack on Pearl Harbor, the Monument of States is a folk art sculpture located in Kissimmee, Florida that was not surprisingly built by volunteers. 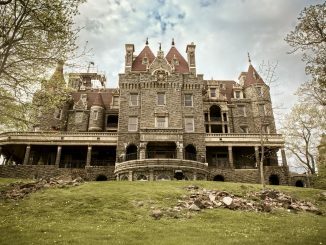 Once the design was completed and the plans for construction were drawn up, donations of stone came from around the world, including some from President Franklin D. Roosevelt. The idea for the monument was that of Charles W. Bressler-Pettis, who hoped all along that it would become a tourist attraction bringing people from all over the United States to the little city of Kissimmee, as well as to inspire American solidarity in response to the attack. Charles W. Bressler-Pettis was a retired physician and president of the Kissimmee All-States Tourist club, a club that primarily catered to senior citizens. Prior to serving in his role as the president of a senior citizens travel club, he served in the Royal Army Medical Corps and the United States Army during World War I.
Pettis, a constant traveler had amassed a collection of thousands of rocks from around the United States on his own, and he donated many of them to help get the project started. He also sent Governors of each of the 48 states letters from requesting that rocks from their states be sent to Kissimmee for inclusion in the monument. Local businesses and residents donated time, money, materials, and labor for the monument, and 507 individual bags of cement were donated one at a time. The Monument of States was completed in 1943 and contained more than 1,500 stones and donated objects from all around the world. The dedication ceremony was overseen by Florida Senetor Claude Pepper. After the 1971 opening of Walt Disney World in Orlando, the Kissimmee monument say a steady decline in visitors and subsequently fell into disrepair. In March of 1993, the city decided that a re-dedication ceremony and inclusion of a time capsule would bring back the tourists and with over nearly a decade of looking for help was stunned when the American Automobile Association offered to help with the restoration in 2001. With the restoration completed and the monument back to its original glory, though not its former fame, it was declared a historic monument and added to the National Register of Historic Places on December 8, 2015. 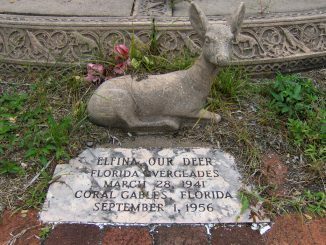 When Pettis died in 1954, Kissimmee changed its regulations on burials and permitted some of his remains to be interred in a portion of the Monument of States. A plaque honoring his work on the monument and dedication to the United States was proudly placed at the site for future visitors to Kissimmee to see. The Monument of States is located at 300 E. Monument Avenue in Kissimmee, Florida. President Franklin D. Roosevelt donated a rock from his estate in New York. Those in Kissimmee who contributed in any manner have their names inscribed on the adjacent sidewalk. The Monument of States was added to the National Register of Historic Places on December 8, 2015. J. C. Fisher, a friend of Pettis, helped to designed the monument to include stone from all of the 48 United States (Hawaii and Alaska were not yet states). At the top of the Monument of States stands an American eagle and a flag of the United States, resting on a blue concrete orb representing the world. The step-pyramid style monument weighs an estimated 100,000 pounds and is reinforced with 3½ tons of steel.